I've been looking for this floppy controller card for over a year. Now I got a CompatiCard I (Rev B). This card is really a versatile floppy disk controller. No.1 of the following table is my own CompatiCard I. I got the informations about the other cards from the internet (pictures). As you can see, most of the FDCs are 8272A chips and one 765A. See manual page 5-1: "CompatiCard uses the 765 or 8272 diskette controller chip to achieve compatibility with the IBM diskette controller." Follow this link to the original IBM diskette drive adapters. The CompatiCard I supports a variety of formats, see the figure below. First time I installed the CompatiCard in an AT compatible 80268 motherboard as the primary floppy disk adapter. The operating system is MS-DOS 3.20. As floppy drive A: I have a TEAC FD-55BV (360 KB) and as drive B: a TEAC FD-55GFR (1.2 MB). Both drives are installed with one twisted 34 pin cable at the plug P2. In the BIOS both drives are correctly set. The DOS startup process "sounds" normal as ever. But! Without installation of the CompatiCard software (ccdriver.sys) only drive A: (360 KB) is usable. Drive B: (1.2 MB) is visible, but the logical 1.2 MB format is not recognized. Only after installation of the driver the 1.2 MB drive is recognized correctly and can be used. Then I exchanged the 1.2 MB floppy disk drive for a 360 KB drive. See that, the access also works here without the CompatiCard drivers. In other words, the CompatiCard only supports 360 KB drives by default. For all other formats the CompatiCard driver must be installed. 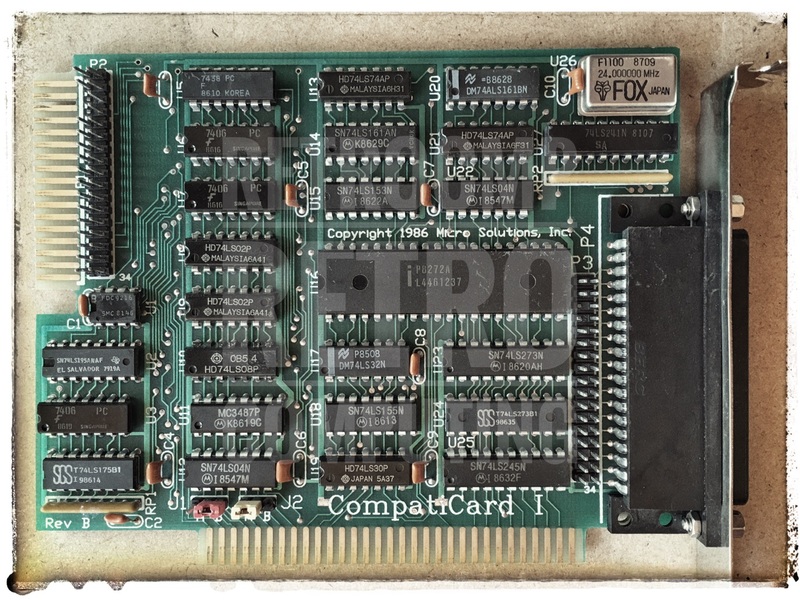 See manual, page 1-1: "CompatiCard can be used as a direct replacement for the standard IBM floppy disk controller card used in the PC and XT. CompatiCard is NOT a replacement for the primary foppy disk controller in an AT type machine." With one CompatiCard you can operate four physical floppy disk drives. In total even four CompatiCards are possible, i.e. you could operate twelve real floppy disk drives in one PC! Of course you may argue about the sense of twelve floppy drives! For example, a multifunctional copy station could be set up in this way. But who still has four CompatiCards today? On eBay at the moment (Oct 2018) a card for about 2.000 $ is offered! My handling of the CompatiCard has shown that the floppy controller P8272A has its certain peculiarities. On its own it works fine, but ... With the program ImageDisk by Dave Dunfield the CompatiCard doesn't work at all. (See ImageDisk manual page 21: "The 765 FDC used in the IBM PC has limitations which are stricter than the WD 17xx/27xx controllers used in many vintage systems.") The P8272A and the 765 chips are the two FDC's used in the original IBM PC/XT controllers. Likewise it is not possible to operate the CompatiCard with the Option Board Deluxe. At least for me it didn't work. Software for the CompatiCard (I, II, IV). This can be real problem. Either you know someone who knows someone or you get an original floppy disk if you are lucky enough to bid for a CompatiCard on eBay. Until recently, the software for all three cards could be easily found on the Internet.